Ordinary number signatures Sawet-Sanoh UNC about 1,300 baht. Solid number xxxxxx signatures Supat-Sanoh UNC about 11,000 baht. Solid number 999999 signatures Sommai-Pisoot UNC about 41,000 baht. 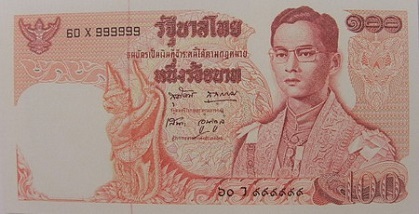 Solid number set 1's - 9's (9 notes) signatures Boonma-Pisoot UNC about 190,000 baht. 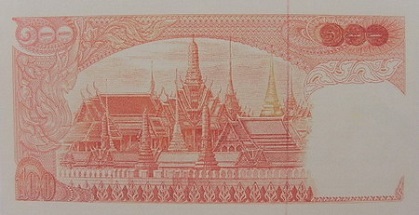 This 100 baht banknote was issued on October 12th, 1972. The main color of the banknote is dark red. The main object is the image of King Rama 9 in full regalia. The main object is the image of the emerald buddha temple at the grand palace.